Since I wanted the enclosure to be very clear I chose to make it from 5.2mm thick clear Acrylic. The recommended continuous maximum service temperature is listed as 82°C, which sounds low, but even if the inside temperature is much higher the actual plastic temperature will be much lower since it is being cooled by the room temperature air. As there are many styles of enclosures there are also many ways of actually fabricating an enclosure. I chose to laser cut the different pieces and solvent weld them. 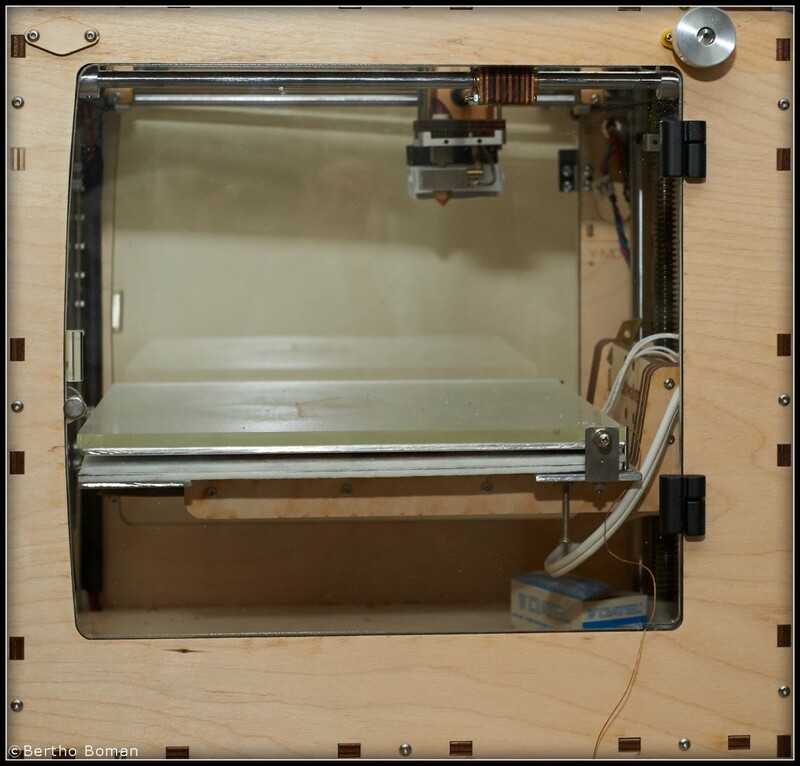 An alternative approach to solvent welding would be screws and nuts like the Ultimaker enclosure. Instead of laser cutting the different pieces they can be sawed. 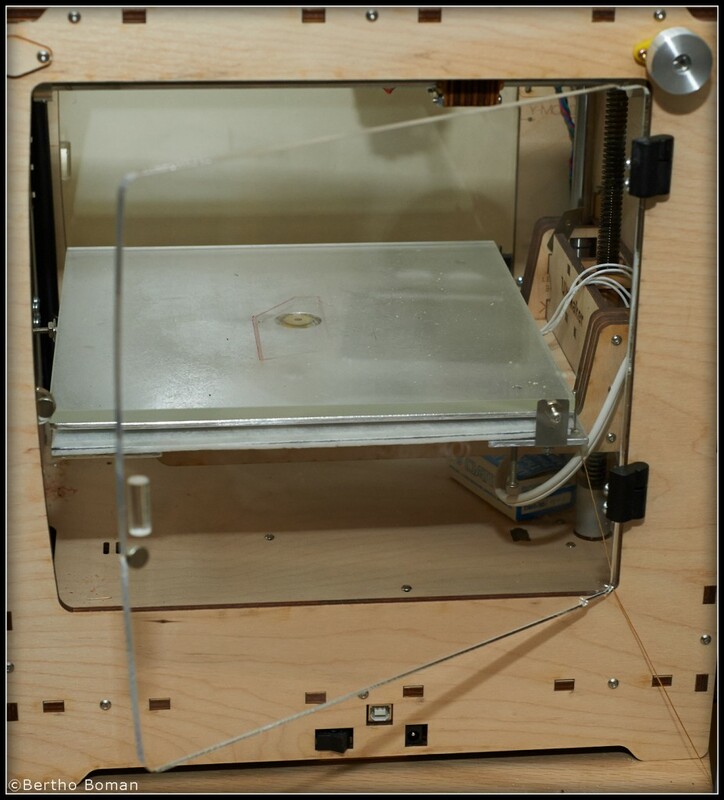 I downloaded the original Ultimaker enclosure laser cutting files from the official Ultimaker website and converted them to AutoCAD drawing format that I then edited to get just the door openings outline. Unfortunately there are several generations of Ultimaker where gradual improvements have been made so some dimensions were not matching my version. After multiple measurements and updating the AutoCAD file to match my Ultimaker, the file was used to generate G-code for the laser cutter and the door panels were cut. My door panels fit flush with the enclosure so they need to have the exact shape of the cutouts. An easy way to manually achieve that is to place the Acrylic panel with the protective paper still on it on the outside of the door opening and then trace the opening outline from the inside of the enclosure and afterwards carefully saw and sand the panels to match that outline. The left side stock fan enclosure slightly sticks out a little bit too far but since I am in the process of redesigning the fan enclosure for dual fans that will not be a long-term problem for me. Temporarily I have to close the door after homing at start-up. Alternatively a small extension piece can be added to the block pushing on the left home switch to make it stop a few millimeters earlier. The secret for achieving the instantly removable doors: The hinges! I bought them from McMaster in the USA. Remember to order both left and right side hinges. Magnets keep the doors shut. Soon! I am too busy to continue writing but at least I got started and got the door information finished.